New Delhi, Oct 15 (KNN) Despite, Free Trade Agreements (FTA’s) and Preferential Trade Agreements (PTA’s), India’s textile trade has not been performing well, said Aditi Das Rout, Trade Advisor, Ministry of Textiles. Speaking at a meeting organized by Indian Texpreneurs Federation in Coimbatore, she said India’s textile and clothing exports are almost stagnant for the last five years. She said that India has 10 Free Trade Agreements and six Preferential Trade Agreements and despite that our trade has underperformed. Such agreements look at various issues and compliance that prove expensive for the small and medium-scale businesses. The textile and clothing industry is largely fragmented and is with SMEs, she added. She also urged the industry to diversify into new markets and products, using branding as an effective tool, and invest to achieve economies of scale. Highlighting the textile exports market for India, Rout said that the top destinations for the textile and clothing exports from the country are the US and the European Union. Substantial exports are also to emerging markets such as the UAE, Bangladesh, and China. 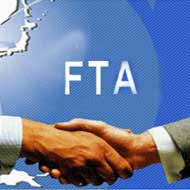 Nearly 63 % of the exports are to markets where there are no free trade agreements. Keshav Chandra, Joint Secretary in the Union Ministry of Commerce, said the Government is working on a National Trade Portal and first module of the portal is expected to be up and running from August-September next year with the focus on four dimensions - logistics, online certification systems, financial systems, and compliances. He said that textile and clothing exporters are struggling to compete with countries such as Vietnam and Bangladesh. “We are not fast enough to see what the next option is,” he said. Further, he suggested having a focused group for each country and study the export-import trends and issues. At the meeting, Indian Texpreneurs Federation presented a report on “Competition Analysis and Way Forward for FTAs for Indian Textile Sector”. According to the report, India faces competition from Pakistan mainly because Pakistan receives zero duty market access in EU. In general, the country’s textile and clothing exports have tariff disadvantage ranging from 1 % to 40 %. The way forward is to seek better market access under current FTA negotiations and have mutual recognition agreements with major export markets to combat impact of non-tariff barriers, report suggested.